Stacy was born and (mostly) raised in the United States, but has spent most of her adult life (and some of her childhood) overseas due to her father & husband’s jobs. She writes about food, with a glimpse into expat life. Since the theme was Easter, I knew immediately that I wanted to make bread. Because what’s a holiday without bread? But what to make? Garlic Pull Apart Bread? Orange Poppy Seed Muffins? Mennonite Paska? I really wanted to make the paska and I probably would have had the reveal been closer to Easter (so I could serve it alongside my grandma’s Easter Bread). So instead I made Rosemary Cornbread Muffins. Cornbread Muffins aren’t a traditional part of the Easter feast, but I thought they could be absolutely delicious side by side with a flavorful Easter Ham! Plus the fresh rosemary brought visions of springtime! The muffins were delicious! They are not as sweet as other cornbreads I’ve tried, so they sharpness of the cheddar and bite of rosemary were really able to shine! Preheat the oven to 375 degrees F. Spray an 8 cup muffin tin liberally with nonstick spray. In a large bowl, whisk together the cornmeal, flour, sugar, baking powder, salt, and rosemary. Pour the wet ingredients into the dry and stir to mix. Fold in the shredded cheese. Divide the batter evenly between the greased muffin cups, topping with additional rosemary leaves for garnish, if desired. Bake in the preheated oven for 18-22 minutes or until the tops of the muffins are lightly browned and a toothpick inserted into the center comes out clean. Cool in the pan on a rack for about 5 minutes. Then run a knife around the edges and remove the muffins from the tin. Eat warm. The title of this post made me instantly hungry, can you please pass me one of those muffins? Great choice. What a perfect addition to the Easter celebration table! I love the addition of rosemary...flavorful and a beautiful golden brown! Love anything with rosemary in it! These would be perfect for Easter dinner. Cornbread and ham are perfect partners. I love that these have rosemary in them. What a perfect choice for this month's theme! Looks divine! 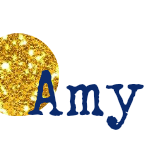 Nice choice, Amy! 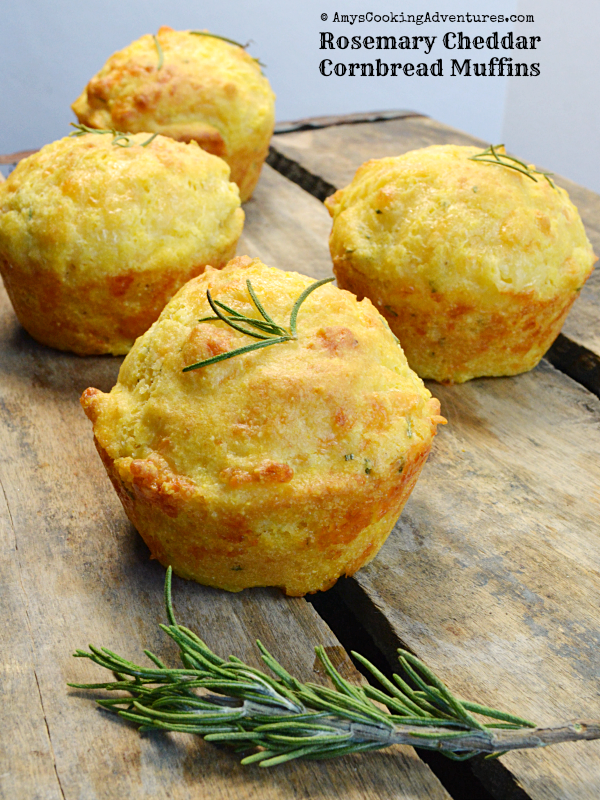 The savory muffins, especially ones with cheddar, are my favorites. yay I love Stacy and i looove these delicious savory muffins! These would be a welcomed treat to my crew for Easter dinner! A lovely choice! 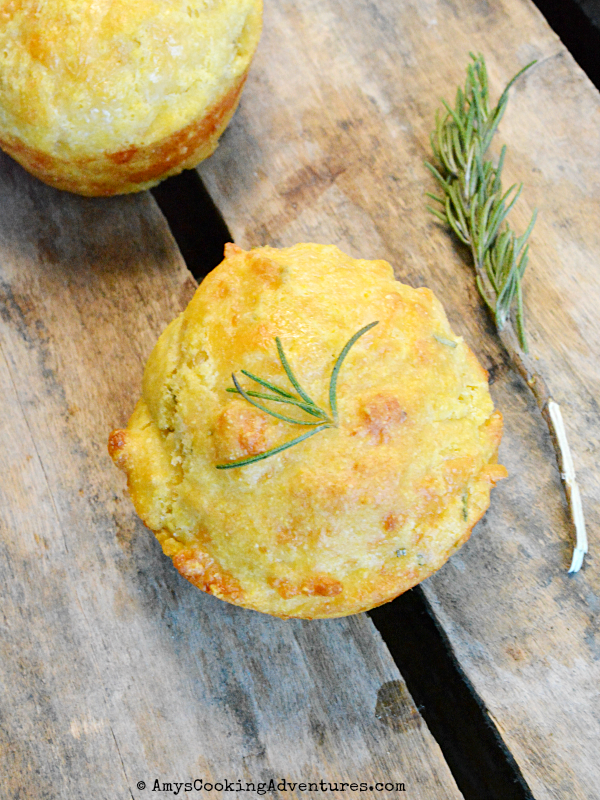 We're big cornbread fans so I'm thrilled that you included these in our little holiday menu! I love the addition of the rosemary and think you're right; served alongside ham, they'd be delicious. These look wonderful! I'd love a couple with baked ham and cannellini beans! I like the idea of rosemary and cornbread together.